Bristol Street Motors Nissan in Darlington has received the Nissan Customer Quality Retailer award for a third consecutive time. The accolade has recognised the Darlington dealership for providing excellent customer satisfaction across the Nissan network. This is the third quarter in a row that the McMullen Road dealership has taken the prize, after topping a customer service survey. 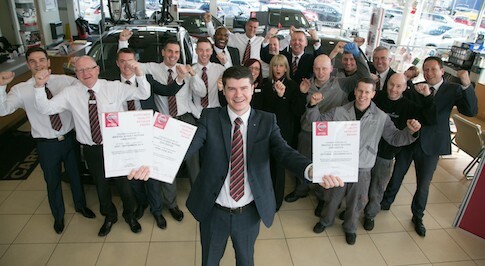 Peter Waugh, General Manager of Bristol Street Motors Nissan Darlington, has praised his team, describing them as "unique", "happy and friendly people" who always work towards "maintaining the highest standards in customer service." Speaking about the award, Peter Waugh said: "Great customer service is always our top priority here at Bristol Street Motors Nissan Darlington, so we are delighted to once again receive this award. The fact that we have been awarded on the back of customer service feedback makes this accomplishment even better. "To win this award for the third time in a row feels just as good as the first time and it motivates everyone here at Bristol Street Motors Nissan Darlington to continue to prioritise customer service and win as many awards as we can."